This review appears here by kind permission of the online inter-disciplinary journal Cercles, where it was first published. The original can be seen here. It has been reformatted and illustrated for the Victorian Web by Jacqueline Banerjee, who has also added the links and captions. Please click on the pictures to enlarge them, and in most cases for more detailed information. Much has been written on the social life of country-house owners and of their servants working "below stairs," but relatively little has been assembled on the technological changes that made these large and often draughty residences into more liveable places. That gap is bridged by this beautifully illustrated book that builds upon a rapid survey of National Trust properties undertaken "to identify and record all early mechanical, electrical, gas and water systems in historic houses and any other items of technological interest" (vii). To complement the results of this investigation, Marilyn Palmer and Ian West visited almost a hundred properties, including houses not held by the National Trust, in all parts of the United Kingdom. They also drew on archival materials and the results of enquiries made by other researchers, including some in-depth studies such as those of Audley End (Essex) and Eltham Palace (Greenwich, Greater London). They found that country-house owners were pioneers in the improvement and acceptance of home comforts including running water, sanitation, central heating and electric lighting, but noted that progress was uneven across both time and space. 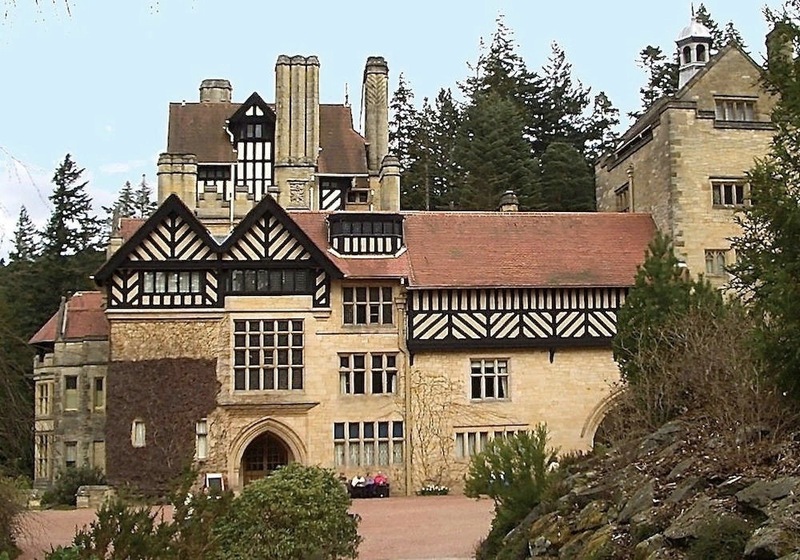 Lord Armstrong's Cragside in Northumberland, extensively altered by Richard Norman Shaw in the 1870s and 80s, and often mentioned in this book, was one of the most technologically advanced houses in the country (see p.10). It even had a lift. Possession of wealth was an obvious factor in explaining domestic innovations, but families with large country houses "varied greatly in their attitude toward change within their houses, whether they were from a long line of 'old' families or were 'new' men who had entered the ranks of landed society for reasons of status and prestige" (175). Some individuals accepted new ideas and techniques, with marriage sometimes proving to be the critical turning point. Many wives simply would not tolerate the level of domestic discomfort that their husbands and their forebears had accepted. The increasing availability of high-quality cast iron toward the end of the 18th century led to many improvements, including water pipes and stoves. Iron was used in place of timber in constructing buildings and providing internal fittings. Despite these opportunities many owners of country houses were laggards or employed new features in their grounds rather than in their dwellings. Thus, on many estates, piped water supplies were "first introduced to provide water for the gardens rather than for the house itself, pointing to an innate conservatism" (175). A complementary explanation may be advanced in the ready availability of servants from nearby villages, at least until the final quarter of the 19th century, when conditions changed dramatically. The falling incomes of the landed gentry following the agricultural depression of the 1870s, together with the alternative avenues of employment open to young girls in particular made the employment of vast numbers of servants increasingly prohibitive in the final decades of the 19th century. The First World War exacerbated a trend already in existence and by the 1920s, labour-saving devices, often previously thought of as the eccentricities of particular individuals, now became a necessity . Nonetheless, some country house owners stubbornly refused to have even electric lights or central heating installed until the late 1960s. the dwindling financial resources which many country estates experienced from the late 19th century has meant that the physical evidence of these early examples of domestic innovations has often survived, rather than being swept away by later modernisation, as was often the case in town houses and middle-class dwellings (vi). 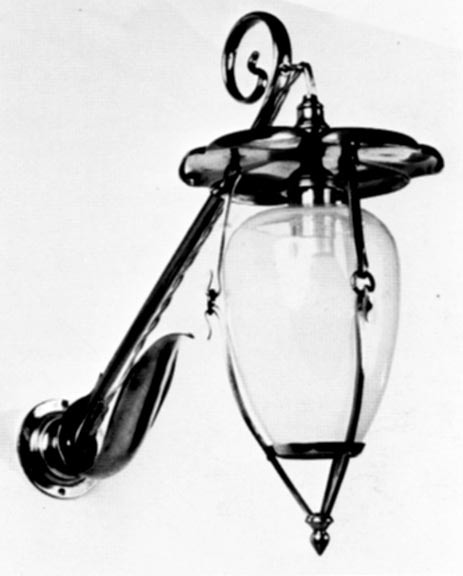 An electric bracket light manufactured by W. A. S. Benson & Co., c.1902. Cragside was probably the first to adopt the incandescent bulbs used in such fitments (10). Improvements to water supply were of vital importance, but the "pumps being developed for fountains and cascades [were introduced] at a time when servants were still fetching water for use on upper floors from taps in the basement" (21). Bathrooms and improved sanitation were made possible. Privies that discharged into moats or streams were replaced by water closets and local sewage works. In addition, food preparation could be rendered more hygienic. Firefighting was enhanced once water was readily available, but manual pumps were adopted slowly and upper stores remained vulnerable. Most country houses continued to rely upon leather buckets filled with water or sand being deployed by their servants. Oil lamps and candles were overtaken first by coal gas, with some great houses having their own gasworks, and then by electricity. On some estates, ingenious water turbines were installed to generate electric power. Free-standing cast-iron stoves were introduced in a few country houses but most were reliant upon open fires until well into the 20th century, thereby sustaining "the massive servant effort required to cut and lift logs, carry coal around the house, and make and clear out dozens of open fire grates" (112). Some estate owners even installed railways or canals to transport coal to their country seats. 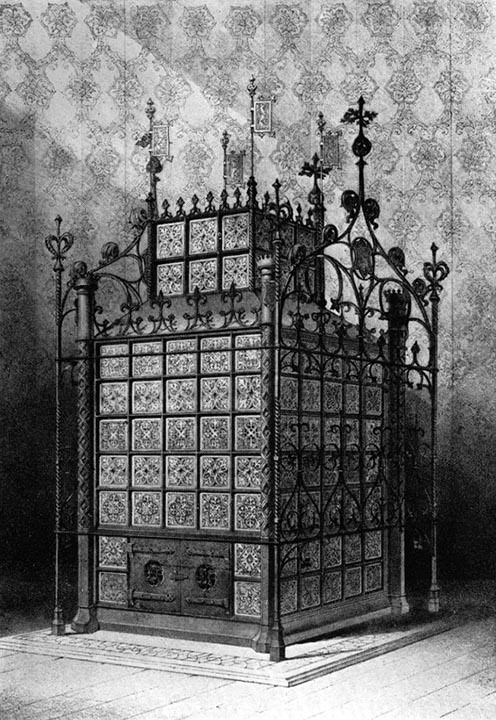 A. W. N. Pugin's Gothic-style free-standing metal stove of 1851. Technology in the Country House is full of fascinating details which enliven the core narrative of slow and uneven improvement. I was intrigued to learn about south-facing "hot walls" installed in kitchen gardens to assist the production of exotic fruit and vegetables. These features were "made of brick with internal flues through which smoke and heat from a furnace would be circulated to warm the wall" (38). In some instances, greenhouses and orangeries were built on to earlier "hot walls." At the other extreme, many estates had designated ponds where ice was cut in winter and stored in an array of special ice houses whose content was used in rotation to help keep food fresh. Local ice was considered inappropriate for adding to drinks, with "pure" ice being imported from Norway. Returning to the issue of heating, the introduction of elegant stoves owed much to Abraham Buzaglo, the son of a Moroccan rabbi, who came to London soon after 1760 and was granted a patent for manufacturing multi-tiered free standing cast iron stoves. 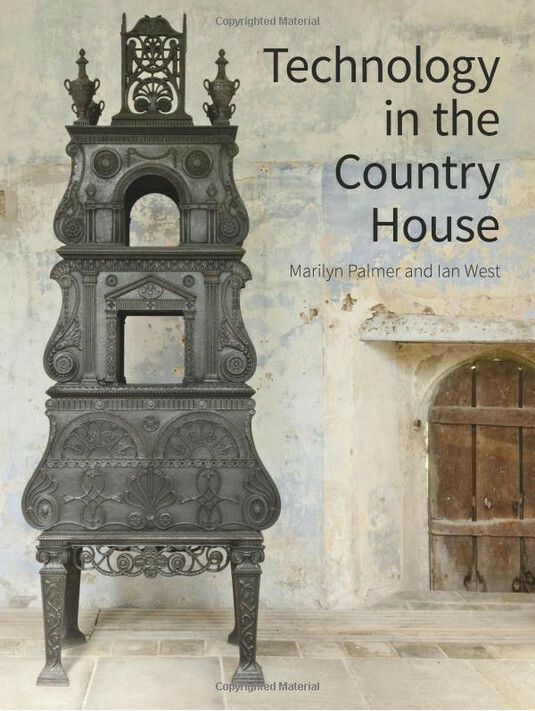 Marilyn Palmer and Ian West conclude their highly informative book by revealing the changed tastes of visitors to National Trust properties and other great houses in the early 21st century. No longer are they mostly interested in architecture, furniture, paintings and gardens, but now also in the people who lived and worked in the houses, not just the family above stairs but the servants as well. This has led to a considerable change in the ways in which many houses are presented to the public . Custodians and guides now take visitors along itineraries that include basements, cellars and attics that were previously off limits. Technology in the Country House is nothing less than a visual treat that reveals many of these previously hidden locations. It also takes readers to corn mills, water towers, gasworks and other technological innovations sited beyond the immediate environs of the great houses. A review of the same book [by George P. Landow]. Palmer, Marilyn, and Ian West. Technology in the Country House. Swindon: Historic England and the National Trust, 2016. Hardback. 205 pp. £60.00. ISBN 978-1848022805.